These lovely, quality ceramic oil burners are perfect for heating your favorite essential oil, creating a gentle, long-lasting aroma that will fill any room. These high-quality burners are hand-painted ceramic, and are large enough (just as ALL our oil burners are) to prevent the water and oils from boiling right out of them. 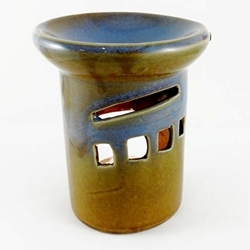 As most of our oil warmers, this Rustic Tower stands about 4" tall and comes complete with a set of 10 unscented tea lites.